Something is crashing through the willows at the edge of our campsite. I put down my coffee and stand to see what is making such a racket. I see three shapes through the bushes, and start to sit down again – just some deer. Hold on. That’s no deer. She lifts her head into the sunlight to get a better look at us. 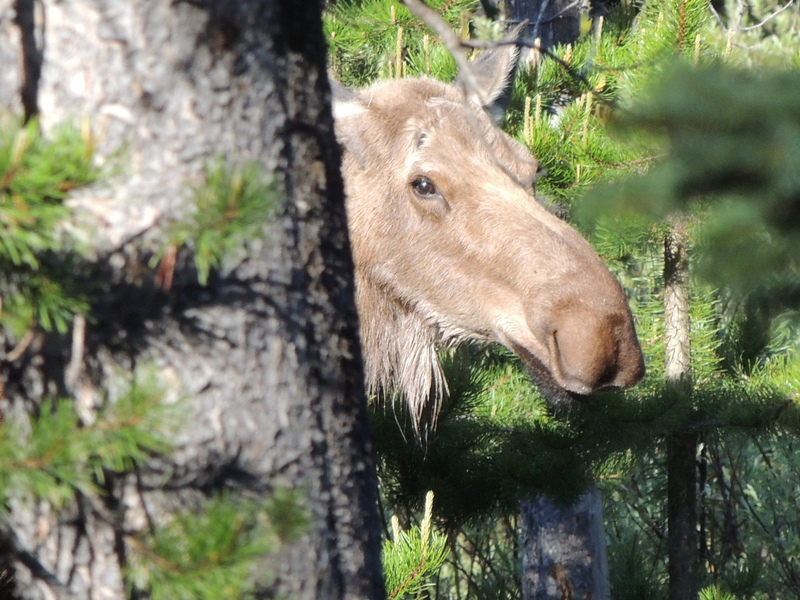 To my surprise, she doesn’t bolt, but just keeps on browsing while keeping a close eye on her kids. At one point something startles them and one of the calves makes a run for it. Mama wakes up then, and chases the wanderer around the underbrush until he gets back under control. She then decides that putting the creek between her and the campers is a good idea. 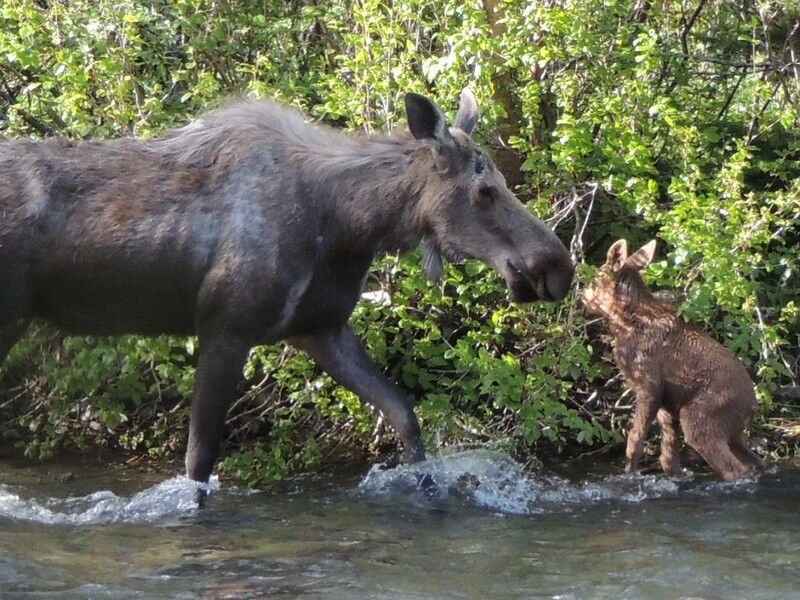 The smaller calf is not too sure about crossing the stream, but he finally decides to brave it. Being left behind is not a good option! Mom gives him a reassuring peck when he gets to the other side. I’m sure that the little family will disappear into the woods now. 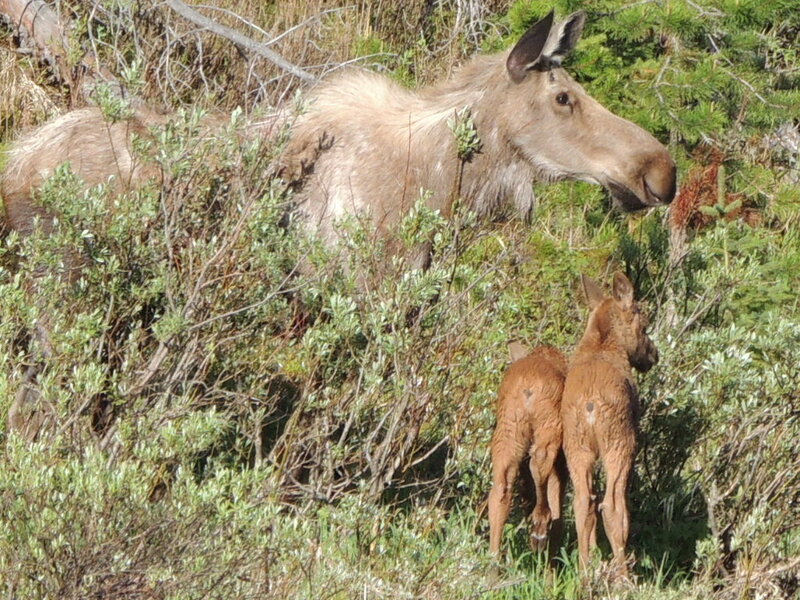 But no, they hang around while mama enjoys the tasty willow shoots and the morning sunshine. 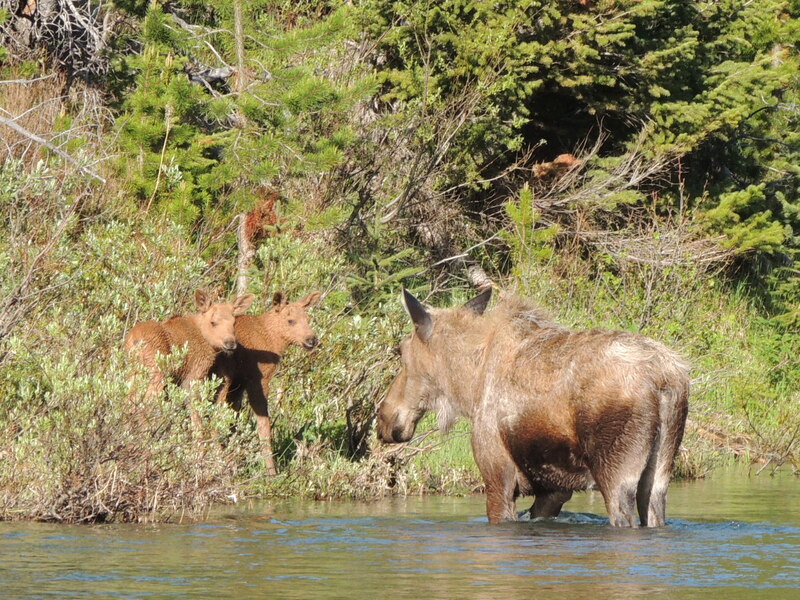 After a while mom decides that she’s browsed enough and she leads her kids upstream. Not a bad way to start the morning! 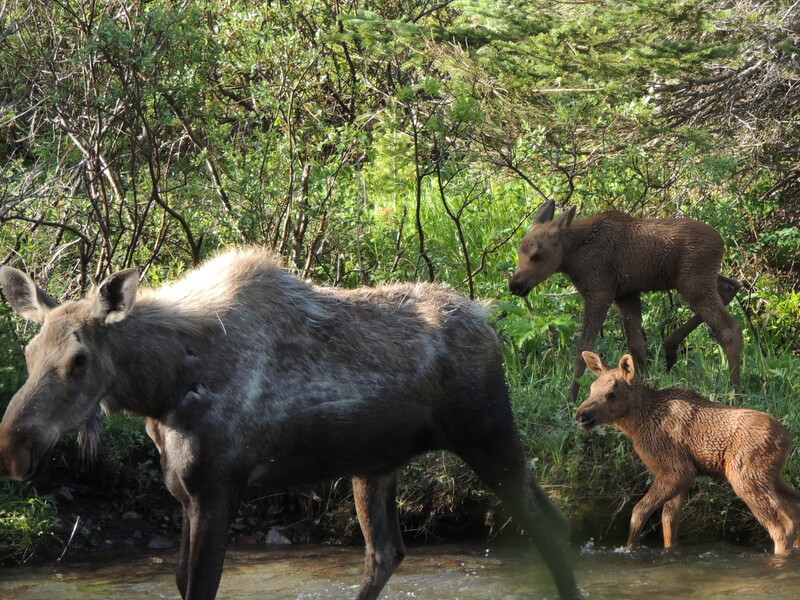 This entry was posted in Montana, Nature, Outdoors, Wildlife and tagged Glacier National Park, Many Glacier Campground, moose calves, moose family. Bookmark the permalink. Awwwww. So cute! 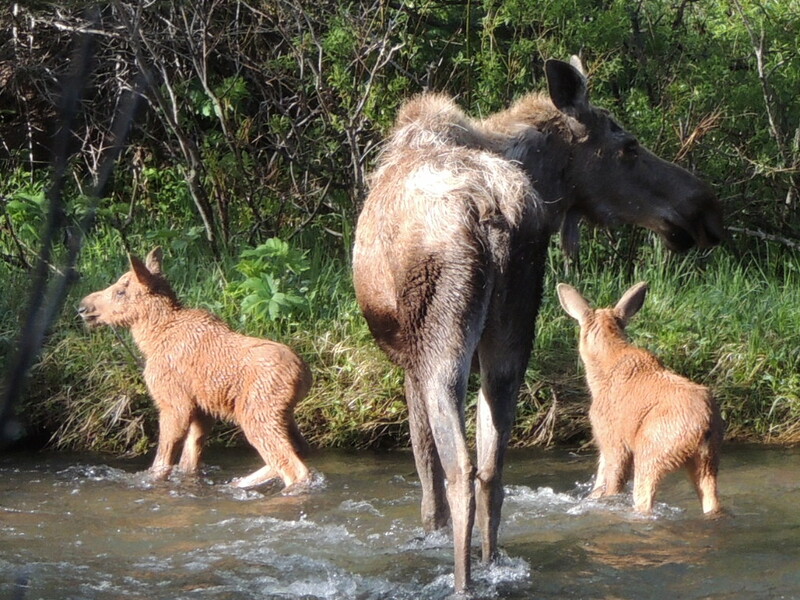 Seeing a moose is always a treat, but a moose with babies is really something. Lucky you! So good to hear from you, Angela! It was lucky, that’s for sure. Oh my gosh, they are so darn cute. How lucky to see this adorable family. Wow! that is incredible to see. can’t they be aggressive? They can be, for sure. We made sure that we had plenty of trees between us and them. If she’d started acting twitchy, I would have been out of there! Now that is some morning excitement. 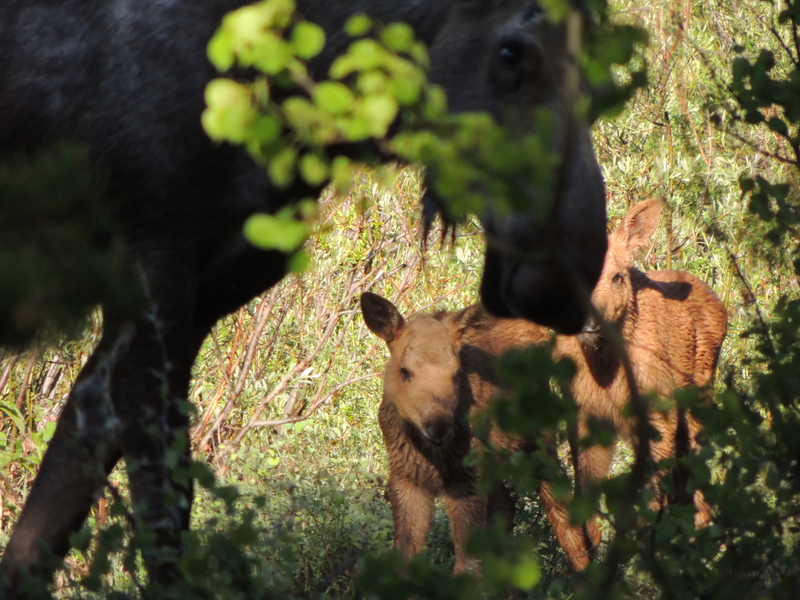 The calves look quite young, and two of them must mean mom had some pretty good nutrition over the winter. Congrats on a great series!! Thanks – it was pretty fun. Can you tell how old the calves are? A month? Or younger than that? 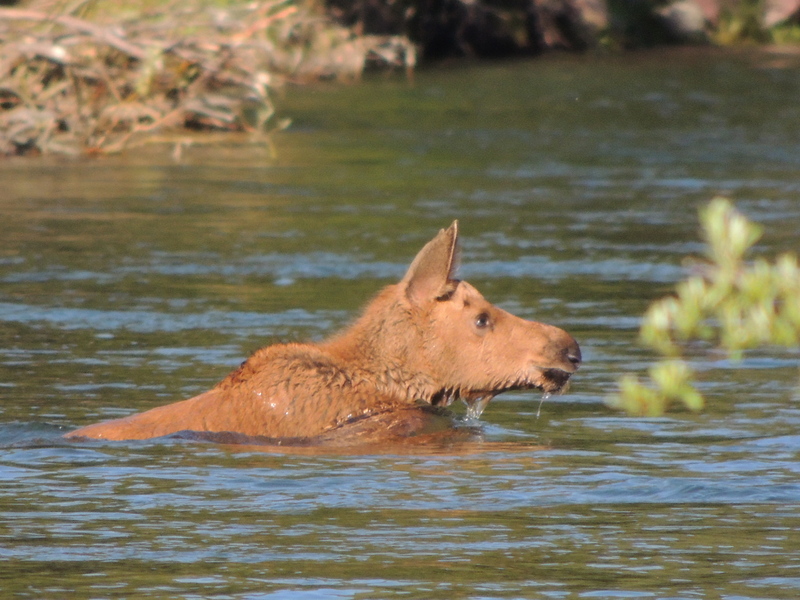 How brilliant to have seen Mrs. Moose and her family! Great pictures. You have the coolest experiences! This was a pretty dandy morning! What a start to the day – wonderful! It was a pretty good way to start the day – I agree!